Halloween 2010 was jam packed with things to do! I hope this isn't an indication of how all future Halloween endeavors will be. I opted to just buy Sarah a costume this year. I'm not crafty and didn't want to stress out over making a costume Sarah would just have to be carried around in. So thank you Costco for knocking one thing off the to-do. Saturday night we went to trunk-or-treat at church with the Joiners. Sarah was a little cranky faced at trunk or treat when we first got there, but after she saw all the kids running around from car to car she got really excited and would flap her arms and make cute noises. She filled her adorable halloween bag that Laura made to the brim, and then crashed in the back seat on the drive home. Sunday, Halloween, we kicked off the celebration by video chatting with my parents for a few minutes so they could see Sarah in her costume before heading to the Joiner's church for their fall festival. Sarah was a bit young for all the games, but she did get to enjoy going down the big inflatable slide with Chris. She loved looking at all the kids dressed up and running around. I think she was just dying to get down and run around with Elsie Tate, but unfortunately she's just not walking yet and I didn't want her to mess up her stockings. After that we went to the Cameron's annual Halloween party. Iwa was Belle, Kawika was spiderman, and Leilea was venom. It was absolutely adorable to see those three play with Sarah. But we couldn't stay there long because we had one more engagement on our party schedule. So we headed out to Lakeland to visit with Chris's family. Sarah was crashing in a hurry in the backseat since it was already past her bedtime, but true to form gained her second wind when there were new people for her to play with. When the boys showed up, Sarah crawled around after them trying to play cars and whatever else they were getting into with them. We kept her out way longer than we should have and she passed out in the car before we made it to the end of their street. She slept in her undershirt and stockings last night and still hasn't gotten up this morning (it's an hour past the time she normally wakes up.) Thank goodness we have a year to recover! So cute! 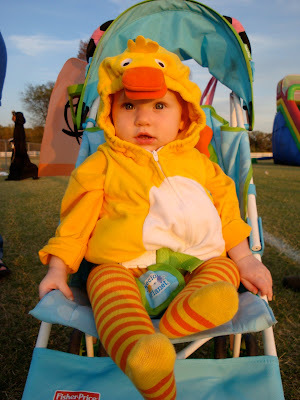 My little girl was a duck for her 1st halloween, too!